In the other hand, other than such activities, there is nothing else to see. Consider your holiday as that very well deserved rest doing the less you can but enjoying the weather, the sun, the food and drinks amidst the backdrop of such a beautiful scenery and turquoise waters. 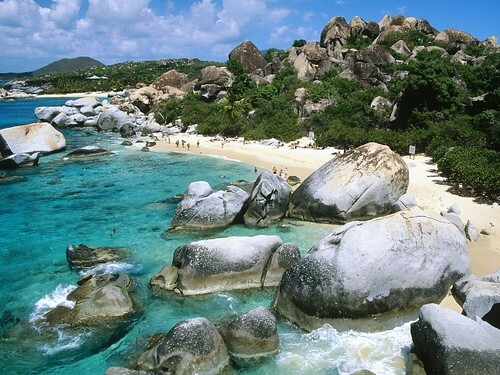 For more information about the British Virgin Islands with Tortola, Virgen Gorda and more check Wikipedia site. The British Virgin Islands currency is the United States Dollar (USD, $). Please note that any price reference is true as from when this guide was created, therefore check prices in advance as with the time they change. Road Town The capital city of the British Virgin Islands, and so of the main and largest island, Tortola. The main port of arrival for anyone either by sea or by air. Belmont Bay At the southwest, in the north coast. Nice and quiet sandy beaches, with great views over the lush vegetation in the hills of Gun and Belmont Points. Long Bay The next after Belmont Point hill, one of the most desired. Cane Garden Beach One of the longest in the island, exactly west opposite Road Town, along the north coast. Brewer’s Bay Beach The next one after Cane Garden, while much narrower than any other, it’s more secluded than the rest, and quite long to enjoy the nature too. Cooper, Trunk and Rogues Bay The most beautiful beaches, north of Road Town, famous for the rock formations between them and the nature. Virgen Gorda The second largest island of the British Virgins, and home to one of the most spectacular beaches and landscapes by the sea in the world with the famous Baths. The boulders aligning the beaches is what makes these unique. Terrance B. Lettsome International Airport is located on Beef Island, just to the east of Tortola itself yet connected via a bridge. Distances over here are truly small so its matter of few minutes towards Road Town city centre. Flights are only available to other Caribbean destinations. The main cruise terminal is located here in Road Town, and it’s the principal means of arrival of tourists. Near the main cruise terminal is the local ferry docks to the other islands, and also the international dock with ferries to the US Virgin Islands. It is here where the speed boats to Virgen Gorda depart/arrive making it super convenient for tourists and visitors. Since this was a cruise holidays and we slept always on-board, there is little I can say about accommodation here in Tortola other than the usual, checking some of our preferred affiliate hotel search engine such as Hotels.com, Booking.com, Expedia, Otel.com, Agoda, Opodo, LateRooms or Ebookers. In any case this is a paradise destination with amazing beaches at the north, and so the very elegant and luxurious hotels. Finding your desired choice won’t be difficult, however it won’t come cheap nor even medium range. This entry was posted in 01. January, 04. North America, 08. December, 2018, 2019, Big Trips, British Virgin Islands and tagged Belmont Bay, Brewer's Bay Beach, British Virgin Islands, Cane Garden Beach, Caribbean, Cooper Bay, Gorda Island, Long Bay, MV Azura, P&O Cruise, Road Town, Rogues Bay, The Baths, Tortola, Trunk Bay, Virgen Gorda. Bookmark the permalink.